Snow overall is a very thick snowsuit which keeps the dog warm in cold weather. They are both windproof and waterproof made with micro fleece lining. The Snow overalls have hoods attached with buttons that can be easily removed. When the hood is removed the overall has a collar that can be rolled up or down. Beneath the collar is a small specially made hole which accommodates attaching a leash. 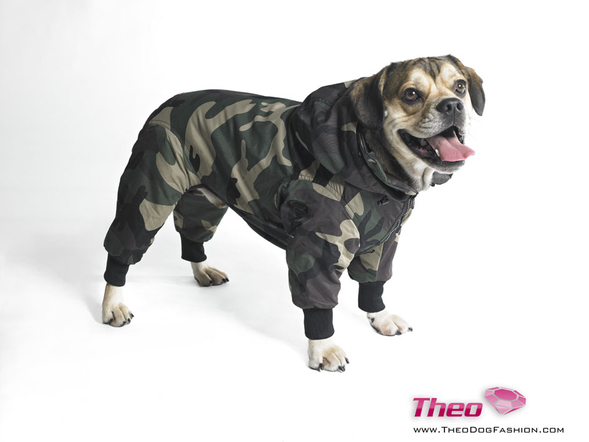 The hood also has a drawstring that can be tightened in order to keep snow, wind and rain from the dog. They are open at the back so the dog can mess in a comfortable and unrestricted way. The sleeves are long with black nylon cuffs. Snow overalls for larger dogs come in sizes XL – 3XL.